Forested headwater streams play an important role in watershed nutrient dynamics, and wood is thought to be a key factor influencing habitat structure and nitrate-nitrogen dynamics in many forested streams. Because wood in streams can promote nitrogen uptake through denitrification, we hypothesized that nitrate uptake velocities would decrease following wood removal. We measured stream characteristics and nitrate uptake velocities before and after wood manipulation experiments conducted at Hubbard Brook Experimental Forest, NH, and the Sleepers River watershed, VT. The mean size of stream substrates and the amount of riffle habitat increased following wood removal. 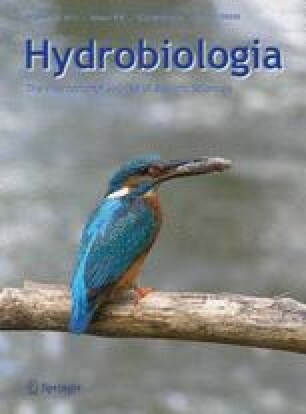 In contrast to our expectations, summer nitrate uptake velocities increased in the wood removal treatments relative to the reference treatments, possibly because wood removal increased the availability of stable substrates for periphyton growth, therefore increasing nitrate demand in these streams. Our results highlight that effects of wood on stream ecosystems occur through multiple pathways and suggest that the relative importance of these pathways may vary seasonally. The online version of this article (doi: 10.1007/s10750-013-1578-6) contains supplementary material, which is available to authorized users. We thank Natalie Day, Allison Fritz-Penniman, Madeleine Mineau, and Jared Nunery for their help in stream and laboratory analyses. We thank Art Casselman of the Cornell University Stable Isotope Laboratory and Jeffery Merriam of the University of New Hampshire’s Water Quality Analysis Laboratory for their help in facilitating sample analysis. We thank Steven Thomas, Emily Bernhardt, and Emma Rosi-Marshall for their contributions and help with N uptake set-up and data analysis. Comments from Jason Demers, Timothy Fahey, Alex Flecker, Christine Goodale, Jim Lassoie, Julie Pett-Ridge, and two anonymous reviewers improved this manuscript substantially. We thank Ian Halm (USFS), Donald Buso (CIES), and Geoff Wilson (HBRF) for their help at the Hubbard Brook Experimental Forest, and Jamie Shanley (USGS) and Lenny Gerardi (VT fish and wildlife) for help and access at Sleepers River. Funding for this research was provided by the EPA’s Science to Achieve Results (STAR) graduate fellowship program, by a USDA Forest Service NSRC grant, by the McIntire-Stennis Forest Research Program, and by the Cornell Biogeochemistry and Environmental Biocomplexity NSF IGERT Grant (NSF DGE-0221658). This publication does not reflect the view of any sponsoring agency. The Hubbard Brook Experimental Forest is operated and maintained by the US Forest Service, Northeastern Research Station, Newtown Square, PA.